Payment conditions: 30% deposit to be paid upon group confirmation & balance total amount due not later than 7 days prior to arrival. Linen & VAT included. Please note beds are not set up already: your bed linen kit will be available on your bed for you to set it up. Breakfast and towels are not included in the rates and available with an extra cost. While our dorms are not suitable for guests aged 12-16 traveling alone, we do accept them when accompanied by over 18s and when the dorm is entirely booked on an exclusively basis (as a private dorm and occupied by the same group). 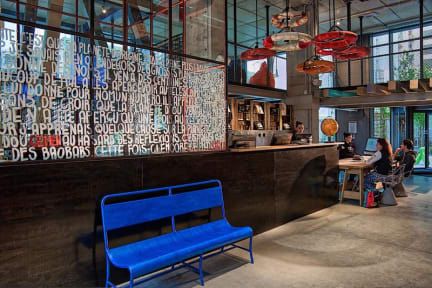 Anda Venice is a brand, recently opened design hostel in Venice Mestre. We have put extreme care and passion in designing all our dormitories and rooms so that all our guests can both enjoy a quiet rest, and hang out in a pleasant, contemporary environment which inspires infinite human connections. Our mood is one of a kind, we aim to be “glocal” Anda Venice, a place where international travellers will get a unique chance to mingle with local millennials and, why not, the way around. We believe this explosive “glocal” dimension will create added value to the thousand interactions, turning a simple hostel stay in an immersive travel life experience. We enjoy a prime location, 10 minutes by bus to Venice train station. This means that you can catch one of the several buses and train taking you to Venice in a short 10-minute ride. It gets even better… we are a super short 2-minute walk to the train station! In addition, from our facilities you can visit some of the finest attractions of Venice such as Piazza San Marco, Galleria Giorgio Franchetti alla Ca' d'Oro, Museo Ebraico di Venezia and many other fantastic landmarks and spots of our area. All our rooms are exclusively ensuite with in-room but separate shower, toilet and wash basins: this means no more waiting when getting ready! You can opt for female or mixed ensuite dormitories with 6, 7, 9 beds. Did we say there are going to be plenty of bright and spacious interactive spaces? 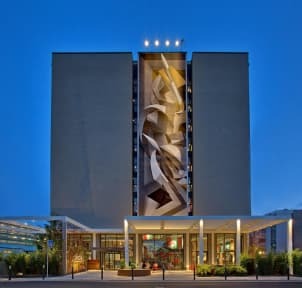 There is going to have a communal kitchen, fully equipped with utensils and kitchen appliances, a breakfast area, a design bar and plenty of indoor comfortable seating areas with design furniture, hanging plants, and external patios. Check out from 06:00 to 10:00 . Only 1 small and medium size pet per room accepted. Please advise before arrival. I would definitely recommend staying in this hostel. It's pretty cheap and everything is clean and pretty new (2019). The kitchen is well equipped to make an easy dinner. Easy to get to Venice island. And the stuff is very cooperative. 베네치아 본섬들어가기 마지막역에서 걸어서 5분정도 밖에 안걸렸어요. 호텔처럼 큰 호스텔이었어요. 방고 적당히 넓었고 깨끗했어요. 주방도 엄청 커서 음식만들어 먹기에 전혀 불편함이 없었습니다. 코인세탁기도 있어요. 주변에 아시아마트들도 두곳정도 봤던 것 같아요. 한국음식들이 꽤 많이 있었습니다. Nice very new Hostel! Perfect for a holiday in Venice. Only negative point, the bathroom and showers are in the doorm rooms and the sinks are right next to the beds. It can be annoying if someone needs to brush their teeth or wash the face. All in all a great hostel! I would really recommend it!